Like a lot of people, I discovered P90X by accident. It was early 2008 and I was searching the DirecTV guide for a show on the New York Giants (HUGE FAN) when I saw a listing for a half-hour program set to run at like 2 a.m. entitled “Get Ripped in 90 Days.” I didn’t know what to make of it and out of curiosity I set it to record. The next day I watched the program and was floored. I had worked out on and off for most of my life and never got in the kind of shape these people on my TV screen (ordinary people like me!) were in; and in 90 days no less! I was convinced this was the way for me to finally get those 6 pack abs. I went to the website the TV told me to go to and ordered it on the spot. Then I got nervous. What if this was all a lie? What if it was BS? Oh no, what did I just do? So I started researching online about P90X. (Note to everyone making any kind of purchase – the idea is to research BEFORE actually making the purchase.) As I searched and searched, I could not find anything negative about the product. All I saw were stories about how great P90X was and combined with the amazing transformations I was seeing of people on YouTube, I was able to breathe easy and know I made a good decision. So the package arrived, I opened it, watched the introduction DVD and part of the first workout. I bought a pull-up bar and the P90X Results and Recovery Formula. Then I did what a lot of people do. I set it aside and did nothing. STUPID! I kept putting off a start date because that is what we as humans do – we like to procrastinate; even with something as beneficial to us like getting healthy, we put it off. FINALLY in April 2008 I began my journey with P90X and what an incredible ride it’s been; it’s changed my life in more ways than I can explain. In the beginning, the workouts were brutal – I could bar ely get through them and after day one I was as sore as I’d ever been. I stuck with it and as each week passed it became easier and easier. That is NOT to say P90X is easy, it is not, but the act of doing the exercises and moves became easier. I was able to increase my fitness level and at the end of day 90 I have to admit, I was pretty ripped. I couldn’t believe it – I dropped 30 lbs and nearly 15% body fat. I had never been able to get into this kind of shape. The best part was, it was now summer and I was able to “flaunt” my results by the pool, at the beach, on the basketball court. It was great to watch the reaction of people who knew what I looked like just 3 months prior – they could not believe what I looked like; the best part is they all wanted to know what I did. It was simple, I told them…P90X! If you have always wanted to get into shape or into even better shape, the time is now to try P90X. You will get into the best shape of your life! It will work for you, I’m living proof of that, as are thousands of other people who have done P90X. 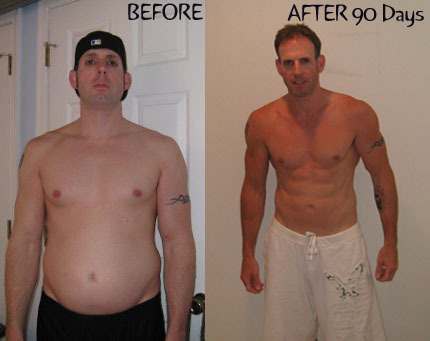 P90X 3-Phase Nutrition Plan designed to help you lose fat while maintaining high energy levels. Chest & Back – Targeted strength and definition workout emphasizes two classic upper-body exercises. Plyometrics – Explosive jumping cardio routine proven to dramatically improve athletic performance. Shoulders & Arms – Potent combination of pressing, curling, and fly movements, that will leave you stronger. Yoga X – Combines strength, balance, flexibility, and breath work to enhance your physique and calm your mind. Legs & Back – Get ready to squat, lunge, and pull for a total-body workout like no other. Kenpo X – Intense cardiovascular workout with punching and kicking for endurance, balance, and coordination. X Stretch – Achieve a higher level of athleticism over a longer period of time, plus prevent injuries and avoid plateaus. Core Synergistics – Build and support multiple muscle groups to build and support the core while conditioning your body. Chest, Shoulders, & Triceps – Target both large and small upper body muscles to push you to the brink. Back & Biceps – Flex those powerful biceps and focus on toning and tightening these showcase arm muscles. Cardio X – Low-impact cardio routine that is a fun fat-burning workout that will leave you feeling lean and mean. Ab Ripper X – Sculpt the six-pack abs of your dreams and benefit your health and physical performance. Following the P90X Nutrition Plan is just as vital to your overall success as any of the extreme workouts in this program. Specifically designed to work in tandem with the P90X routines, this 3-phase eating plan provides the perfect combination of foods to satisfy your body’s energy needs every step of the way. P90X is not about quick fixes or miracle diets. It’s about selecting the healthy foods that you WANT to eat, and determining the portion amounts that will provide your body with the right amount of fuel to excel during exercise.